with unique marbling patterns and colors. Each airy and light tallit is crafted by hand from 100% Chinese Habotai silk for the softest and smoothest feel. This truly, unique and elegant garment is a wonderful gift for someone special or even as a present to yourself. 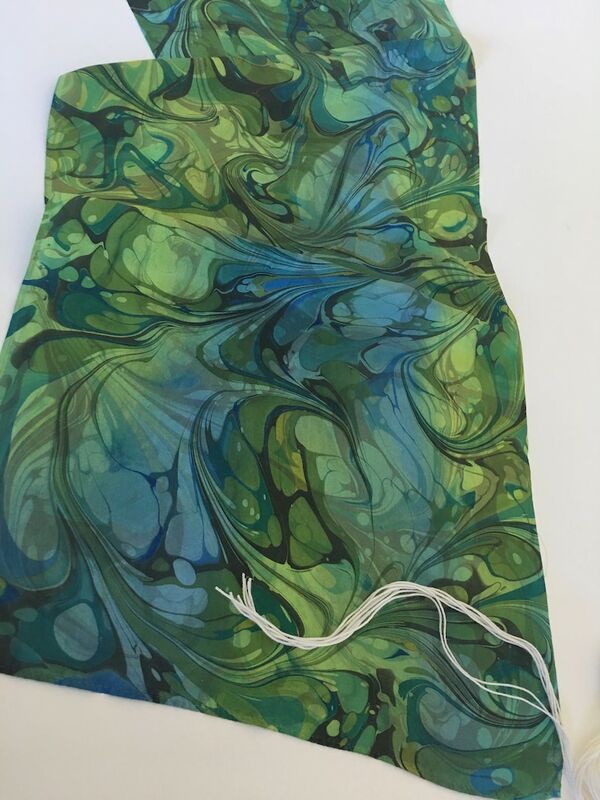 These beautiful tallits are hand-marbled into a one-of-a-kind design with a blend and range of dyes that results in vivid and rich colors. The top of the tallit is distinguished by the traditional prayer or verse of your choice along with a subtle pattern of Swarovski crystals individually applied on the silk. Each tallit is delicately folded and kept in a keepsake silk bag to protect your heirloom. The silk bag can also include a Hebrew name on the front. Each tallit features hand-tied tzitzits on all four corners, recognizing the antiquity of today’s observant Jews. Yes, as each tallit is hand-crafted in the marbling process, the colors and sizes of each tallit can be customized upon request. WHAT ARE THE DIFFERENT SIZES AND PRICING? Our silk tallits are created on an individual basis ranging from $250-$350, made in the USA and are available in 72-inch length and in either 14-, 17-, or 21-inch widths. CAN WE SEE MORE EXAMPLES OF THE TALLIT COLORS OR PATTERNS? Yes, our Etsy Store shows all our current tallits, which include a wide range of colors and marbling patterns. Of course, you can also request a custom design based on colors and patterns you see on our Etsy Store. HOW LONG DOES IT TAKE TO MAKE A CUSTOM TALLIT? Tallits available on our Etsy Store ship within three weeks, as each tallit is handmade. Special requests for custom marbling, prayers and/or other imprints are included in the three week production window. DO YOU SHIP OVERSEAS OR TO P.O. BOXES? HOW DO I CARE FOR MY TALLIT? Gently hand wash with lukewarm and mild soap of your choice, use an iron on medium heat and press dry while slightly dump. Note: Your tallit is individually hand-dyed and hand-marbled. The tallits pictured on this web site are representations of a specific pattern and color theme that we have created. However, because the tallits are individually hand-marbled rather than being mass-produced, no two tallits can ever be identical. Also, the colors displayed on your monitor may vary from the actual scarf due to variances in monitors. Contact ColorVibe Designs today for a color consultation. This is our family’s second tallit from this wonderful artist. She works with every family to make sure it’s perfect. My son is very looking forward to wearing it for his Bar Mitzvah and beyond. The product quality and customer service are truly superior. I wish I had more need for additional merchandise from this shop. A joyous experience for a joyous occasion. Than you so very much. Beautiful job and attention to detail. So responsive as well. Additionally, I loved the willingness to customize and add extra little details consistent with my wishes. Absolutely beautiful! I love this work of art. Thanks so much to Sharon for making everything so easy for me. This was a pleasure, and I know that my daughter will enjoy this for a lifetime! We accept payments through both PayPal and Direct Checkout. Returned or Exchanged items must be in the same condition as when they were sent to you. We do not accept items that have been worn or damaged. You have 10 days to return your item if you are dissatisfied. Once we receive your return/exchange your card will be credited for the merchandise amount or we will send out the replacement item. We do not refund the shipping. We do not cover shipping costs for returning an item. we usually ship within 5 business days silk scarves - Tallit I ship 2-3 within weeks. Etsy sends confirmation email to let you know when your purchase is ready to be shipped. If your purchase is a gift, we can ship directly to the recipient. Please add their address when you checkout, or send me an email with special instructions.